We adopted Grete’s cat, Audrey, years ago when we were living in San Diego. Audrey was, and is, a kitty in serious need of a mental health practitioner. We love her for who she is, and who she is not. That’s how we love people…and cats. Nat and Owen talked a lot about who would get Audrey when they moved out. 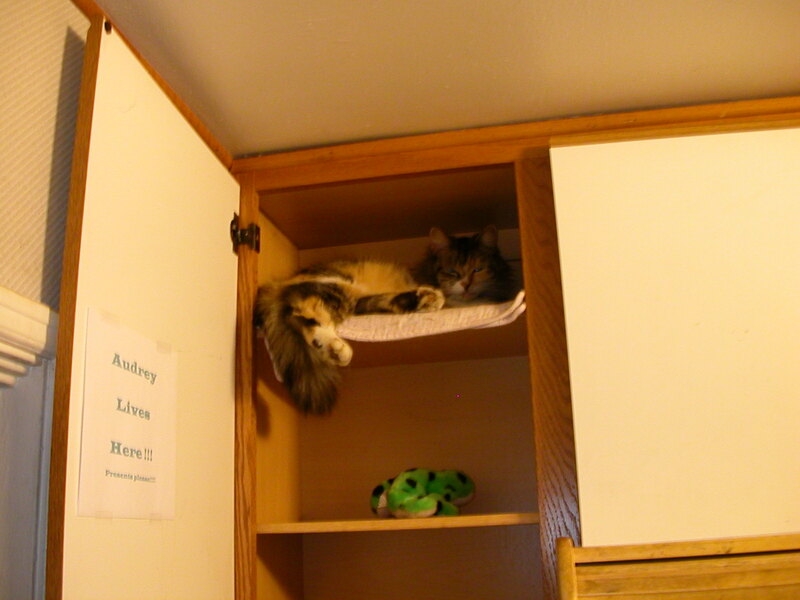 As it turned out, the boys both moved out of our house several times, but Audrey always stayed with us. Owen probably spent more time with her than anyone, given their schedules. Pets are not always welcomed in rental housing, so even though the boys wanted her to be a part of their several homes, she remained a part of this household. She’s still here, still making trouble, still the source of frequent conversations (and photos) – and even more scratches. When we first took her in (Grete was moving to an apartment that didn’t allow pets), Audrey (also known as “Laundry”) didn’t get along with our other cats all that well (still doesn’t). So, we dedicated the cabinets above our refrigerator to her. We left the doors open at all times, posted a sign on the inside of one of the doors that stated, “Audrey Lives Here!!! Presents Please”, and placed her blanket on top of the fridge. That’s where we fed her, and that’s where she lived. (Some of you have heard this story before). At night, though, we heard her jump down from her room with a view…calump, calump…and out the back door she went, whether to howl at the moon, or dig a hole, didn’t matter. We lived in a neighborhood where it felt okay to leave the back door open – just for her. A couple of weeks ago, Lea and Karma came to visit. They noticed the dreadlocks in Audrey’s fur. These weren’t the kinds of dreads that we worked hard to create in Owen’s hair out of his desire to have a new hairstyle. These hairmats (is that a word?) began out of Audrey’s inability to reach her nether regions because she had gained a few pounds after Owen died (originally, her mobility was somewhat limited by her confrontation with a car, wherein her tail was rendered immobile and permanently bare in a 2-inch stretch that gives her a lion tail fashion – not intentional). A few years, and a few too many pounds later, she is unable to reach her back, or her rather-more-private-parts. In recent months, she’s eaten, and slept under the table where we have Owen’s altar in our living room, and scratches at the sliding glass doors only when desperate to get outside. Bathing is an afterthought, an absent thought (better stated, not a thought). I’ve tried for months to brush out her dreads, to no avail. Between the scratches, the bites, and the sheer devastation the brushing caused our precious kitty, my efforts became increasingly infrequent. I like my skin, I like my blood flowing through my veins rather than spilt out onto the carpet. But, every once in a while, I wanted to pet Audrey, to give her the kind of attention Owen and Nat had always given her. I found I didn’t have the energy to figure out a way to cure the dreadful dreads. Two days before Lea and Karma were to return home, I woke to find Lea and a phone book at our kitchen table. She was searching for a groomer who could handle Audrey’s cattitude. The fact that all of us agreed Audrey would need sedatives to become de-dreaded, turned our collective ideas to a veterinarian. We called several. The estimates of “the procedure” were astronomical. What I couldn’t do for Audrey, Dave, or me (pick up the phone and call), I could do for Audrey’s future, once someone brought her unkemptness to my attention. We found the perfect vet, and delivered her the following morning. When I got off work that afternoon, Karma, Lea, and I picked her up at the “special kitty” clinic. Lea went inside to get the now-beautiful Audrey. Lea announced at the reception desk, “Hi, I’m here to pick up Audrey. She came in for a bikini wax.” She was in there much too long, and I finally joined her, to find out if there was a hitch with payment. No hitch. Just a lot of information about cats, cats who don’t have complete mobility for the purpose of cleaning themselves, and the ever-present opportunity to get the derelict pet owner to purchase a “special” comb to keep the fluffy kitty, fluffy. I’m a sucker for making my life easier, and any chance to avoid another trip to a less expensive store to buy the very same thing I can buy here. The vet came out to advise me, grabbed Audrey’s chart (it had become a whole file in a single day, what with the pre-sedative exam necessary to see if Laundry could withstand the drugs – believe me, she should have more drugs, more frequently), and I succumbed to the $13 comb, along with our next payment to the IRS. Audrey is beautiful again, a work of art, and still a mystery. Audrey’s behavior changed after Owen died. She became even more lethargic, more skittish when Sylvester and Princess (our other cats) approached her. I felt so bad for her, as Owen had protected her in their rooms upstairs. She still paws at the doors to his rooms, which I keep closed now, because she kept leaving parts of herself strewn about his furniture, and I couldn’t face the constant cleanup. Owen was predominately nocturnal, and that suited Audrey back then. Now, she’s just “turnal”, neither noc- nor di-. I pet her, scratch her ears and her neck, and comb her frequently (that $13 comb was worth the price). So far (almost three weeks), Audrey has remained the vision of familial affection, and the proud owner of a bikini wax and a 4-inch long shaved spot on her back. Blood has been drawn…mine…but I’m keeping company now with Owen’s and Nat’s favorite cat, without the deep, dark thoughts associated with what might be imbedded in Audrey’s dreadlocks. I think we’re all a bit happier for it. ~ by Linda on March 12, 2008. Yes, Audrey is special. But so are Sylvester and Princess, aka(PeeWee), she has a special way of reminding us of her presences or presents. Then there was Behub-bubba and baby Behub-bubba. Two cats that had a father and grand-father that we named, Big Head Bob. So the off-spring were Big Head Baby Bob and his son, Baby Big Head Baby Bob. I know. Don’t go there. I wish I could remember the names of all the cats that we have had over the years. Maybe, I hope, Linda will write a blog dedicated to just the furry ones of our past. Owen would be able to name them for me. There color, there likes and dislikes. Whether they were roof cats or ground cats. Tree cats or just short bush cats. The thing I love, is that I know, every one of them was that days special kitty when Owen was here. Loved the video! Laughed out loud about Audrey needing a psychologist. I think part of her “new strangeness” (as opposed to “old strangeness”-is that she misses Owen. She’s grieving. She has even fewer answers than you do, and I’m sure her heart is broken. Glad that you braved the blood, the expense, and the time required to make Audrey feel clean again. True love is being willing to reach out even when you may get scratched. A lovely post. A lovely insight into Audrey and her life, and your family. I’m a cat lover myself – although sadly my own beloved cat died in 2004. I see we both postd the same you tube today – great fun aren’t they? Simon’s cat takes me back – all that door scratching and being such a pest ……. but we miss them when they’re not here anymore. I love that she slept on the bed with me during my visit and I love that she has the temperament of an artist.